Reboot your wardrobe with the Maven. 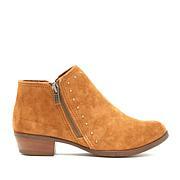 This slouchy boot pairs perfectly with leggings and skinny jeans and transforms your dresses with a western-inspired bohemian flair. 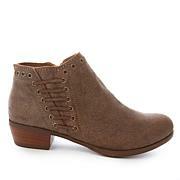 Ease into it via the full side zipper and enjoy a comfortable fit, padded insole and sturdy high heel. I sized up a half size and the fit is perfect. They are slightly padded but I add foam padding because I have planters fasciitis. I walked on both carpet & wood floors and I do not find them to be slippery. Heel height is good and I have a slightly wider foot and the width is fine. Can't beat the price! 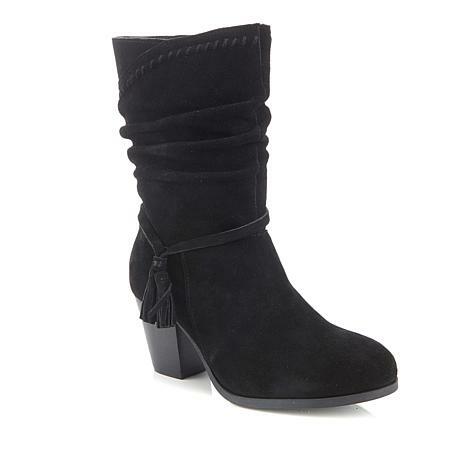 Love, Love,Love these boots. So warm and comfy and cozy. My only wish would be for them to be water resistant. These are my first pair a short boots that are suede. 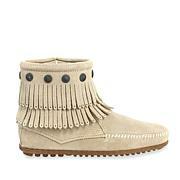 Plus my first pair of Minnetonka's. I am in love! I have a wide foot. These are a little tight but I am hoping that the boot stretches and time. I normally wear a 6 1/2 so I went up to the 7 cuz of the width of my foot. I plan to save these for a trip but have been wearing them already! They go with jeans or with any dress. I can create so many different looks with these boots. I've received so many compliments! Love them! I got them black.